A great vintage full page original magazine ad. Ad measures approximately: 6 1/2" x 10". Condition: EXCELLENT. 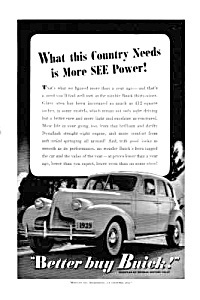 "What this Country Needs is More SEE Power...Better Buy Buick! Certificate of Authenticity is provided to show that this piece is from an original magazine (not a copy).